What’s the Scoop on Coconut Oil? Coconut oil has made news headlines countless times in recent years for everything from being the new superfood to most recently being called “pure poison” by a Harvard professor. It’s no wonder that many of us are left scratching our heads with confusion about what we should or should not eat. So, let’s break it down and look at the facts. Years of scientific research have proven that saturated fats are harmful to our health and increase the risk for heart disease, high blood pressure, and stroke. They do this by altering the levels of the good (HDL) and bad (LDL) cholesterol in the blood, which contribute to the build up of plaque in the arteries. When HDL cholesterol is too low and LDL cholesterol is too high, these plaques begin to form and overtime clog the flow of blood, leading to high blood pressure. When plaque breaks away from the artery wall, it blocks the flow of blood and results in a heart attack or stroke. For this reason, it is important to limit saturated fat in the diet. The American Heart Association recommends that no more than 5 – 6% of total calories come from saturated fat each day. For someone following a 2000 calorie diet, that is about 11 – 13 grams of saturated fat. Foods that contain saturated fat include fish, poultry, meat, dairy products, butter, cream, fried foods, processed foods, palm and palm kernel oil, and coconut oil. 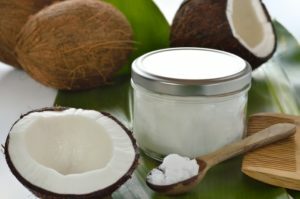 So, despite the mixed evidence of its health benefits, what makes coconut oil different from any other saturated fat? The answer lies in the specific type of fatty acid that coconut is most rich in – medium chain triglycerides. Fat molecules range in length from 2 to 22 carbon atoms, and medium chain triglycerides (MCTs) refer to the group of fatty acids that are composed of only 6 to 10 carbon links. Due to their smaller chemical structure, they are digested and used differently in the body than the longer chain fatty acids. It is the difference in size and how the body processes the fat that differentiates MCTS from other saturated fats and holds the key to the supposed health benefits claimed. However, it is critical to bare in mind that most of the studies citing benefits are often measuring only one marker of health rather than the total health and wellbeing of the subjects. For example, one study of only 19 healthy overweight men showed that MCT oil increased body weight loss by 0.41 kilograms over a 28-day period compared with the group who consumed olive oil3; but blood cholesterol levels, exercise, and other lifestyle factors that contribute to heart disease were not considered. 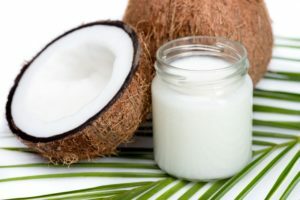 It should also be noted that in this study (and most other related studies) MCTs were consumed in a synthesized oil form rather than from a whole food product such as coconut oil. This is perhaps the most important takeaway from the topic at hand. Overall health and wellbeing are not achieved through consumption of individual nutrients, practice of a singular activity, or measure of independent health markers. Our body works together as a whole, and thus we must treat it as such. A diet rich in non-starchy vegetables, whole grains, whole fruits, nuts and legumes, and fish and seafood that is complimented with moderate amounts of other lean proteins and low-fat dairy provides the ideal nutrition for best health. Lifestyle habits such as regular exercise, moderate to low alcohol intake, adequate sleep, appropriate stress management, and avoiding smoking further improve health and reduce risk for a myriad of diseases and health concerns. As much as it would be loved, there is no magic pill, supplement, or quick solution to our health problems. It requires effort, self-care, and moderation and balance of all good things. The bottom line: Coconut oil is a saturated fat rich in medium-chain triglycerides (MCTs). Despite some health claims that MCTs have positive effects on weight loss, mental clarity, immune function, and even diabetes, there is not sufficient evidence to prove their effect or benefit towards health. However, there is significant evidence that saturated fats contribute towards weight gain, elevated blood cholesterol, and increased risk of heart disease. 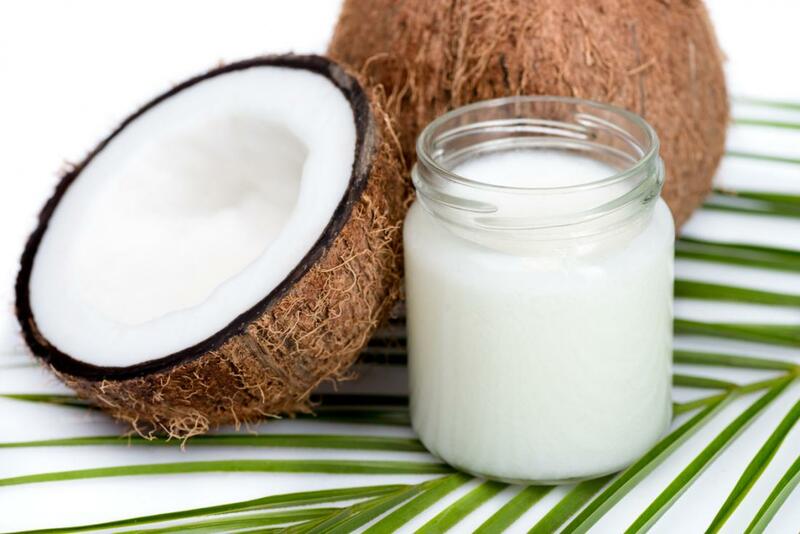 For this reason, coconut oil and other saturated fats should be limited to 5 – 7% of the total daily calories consumed (this is approximately 11 – 13 grams for a person following a 2000 calorie diet). USDA Food Composition Databases website. Accessed August 30, 2018. Academy of Nutrition and Dietetics Accessed August 30, 2018. Subscription required.